Even without the extras of the bundled version, it's still a damn good package. Fantastic value. Slim neck proves easy to play for beginners. Plenty of power. Until recently, the entry-level LTD Viper 10 was available only as part of a package that included an ESP 10-watt amp, guitar tuner, cable, gig bag, strap and plectrums. You can still get that bundle for a fair chunk below the retail price of £270 if you're prepared to shop around. If you don't need the amp and most of the swag, though, you can now buy the guitar in its gig bag for £165. Again, you can pay less if you put in the time. "The Viper's build quality is damn impressive." The Viper 10 looks like a tweaked Gibson SG with extra junk in the trunk. Running through the spec sheet, it has a basswood body, a slim bolt-on maple neck with a rosewood fingerboard and a very cool headstock. Its 'racing flag' profile matches those of the headstock and fingerboard inlays of James Hetfield's Truckster guitars and other ESP/LTD models. The smoky black nickel hardware looks the business, too. Considering the price tag, the Viper's build quality is damn impressive. There are exceptions, though: the top nut could be cut a bit lower and, while we didn't slice anything vital, there are a few sharp fret ends on our review model. The action is quite high, too. That's no drama for our calloused fingers, but you may like it lower. Make sure your Viper 10 is set up to your preference before parting with your cash. The Viper's neck heel is sculpted for easy access to the upper frets and the deep treble side cutaway doesn't hurt your chances of getting to all 24 extra jumbo frets, either. Those big spaces make string bending easy, while the slim neck profile will please beginners and experienced shredders. The Viper 10 packs a pair of open-coil ESP LH-150 humbuckers. 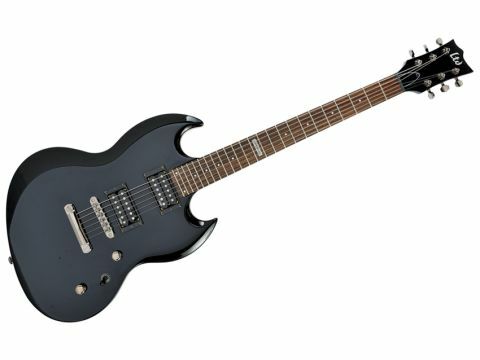 Loaded with ceramic magnets, they're standard issue on some of the pricier LTD models, such as the WA-200 'Will Adler' (Lamb Of God) and GUS-200 'Gus G' (Firewind/Ozzy) signature guitars. The humbuckers pump out usable tones at all gain levels - the bridge unit has plenty of bite, while the neck 'bucker offers more clarity than you'd expect from a budget guitar. But the Viper isn't just a shred monster - it's versatile enough to handle blues, punk, metal or whatever, from clean through to ultra-filthy. That said, the world is your bivalved mollusc of choice when you have 200 sheets burning through your trouser pocket. A sniff round your local music shop will turn up plenty of competition. Squier, Dean, BC Rich, Ibanez and others offer great guitars at this price point. The Viper's obvious challenger is the Epiphone G-310, which shares the bolt-on, twin 'bucker spec. While we dig the Epiphone's authentic 'SG-lite' vibe, we reckon the Viper's two-octave fingerboard and ballsy - yet versatile - humbuckers may give it the edge over its closest rival.